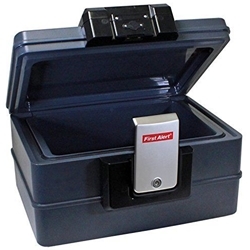 The First Alert Waterproof Fire Chest will give you peace of mind knowing that your important documents and belongings are safe and sound in the event of a fire or flood. Made to hold standard letter-size papers and keep them flat, this chest is also suitable to safeguard computer discs, USB flash drives, and other data storage devices. The chest comes equipped with a waterproof seal along the opening that keeps your valuables dry—even when the chest is fully submerged. This is great for protecting your documents if there's a fire and emergency sprinklers are triggered. The seal also enables the chest to float during a flood, keeping it up out of the water and making it easy to locate. This chest features a durable composite construction with 4 to 8 digit programmable digital lock with emergency override key in case you forget your passcode. This product is backed by a five-year limited warranty and lifetime after-fire replacement guarantee.